In this chapter, we will see the environment setup for Cucumber with Selenium WebDriver and Java, on Windows Machine. Why we need − Java is a robust programming language. Cucumber supports Java platform for the execution. Step 2 − Accept license agreement. Step 3 − Install JDK and JRE. 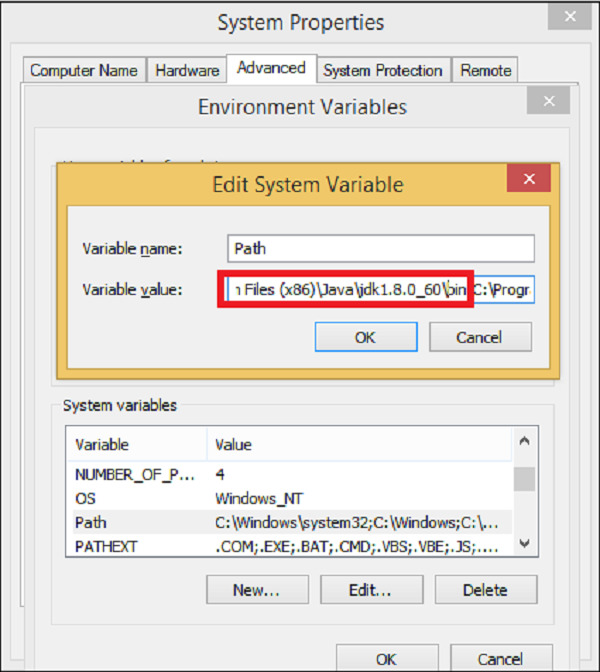 Step 4 − Set the environment variable as shown in the following screenshots. Why we need − Eclipse is an Integrated Development Environment (IDE). It contains a base workspace and an extensible plug-in system for customizing the environment. Step 1 − Make sure JAVA is installed on your machine. Step 3 − Unzip and Eclipse is installed. Why we need − Maven is a build automation tool used primarily for Java projects. It provides a common platform to perform activities like generating source code, compiling code, packaging code to a jar, etc. Later if any of the software versions gets changed, Maven provides an easy way to modify the test project accordingly. Step 2 − Unzip the file and remember the location. 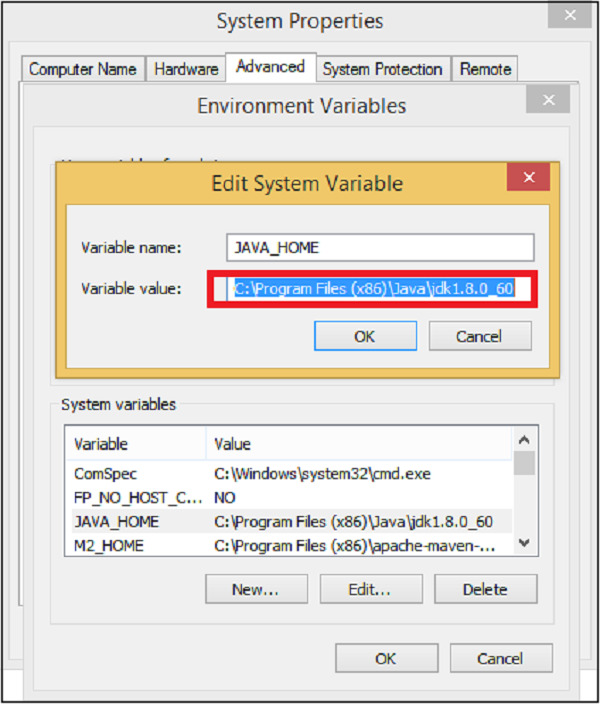 Step 3 − Create environment variable MAVEN_HOME as shown in the following screenshot. Step 4 − Edit Path variable and include Maven as shown in the following screenshot. 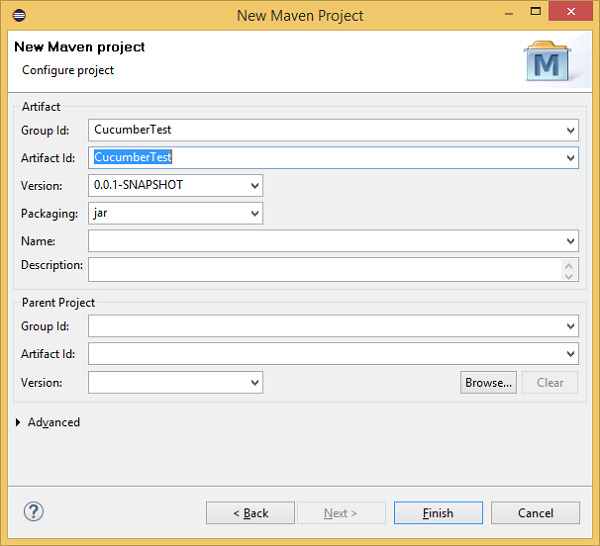 Step 5 − Download MAVEN plugin from Eclipse. Step 6 − Open Eclipse. Step 7 − Go to Help → Eclipse Marketplace → Search Maven → Maven Integration for Eclipse → INSTALL. Step 1 − Create a Maven project. Provide artifact Id (artifact Id is the name of the jar without version. You can choose any name, which is in lowercase). Click on Finish. Step 2 − Open pom.xml. Go to package explorer on the left hand side of Eclipse. Step 3 − Add dependency for selenium: This will indicate Maven which Selenium jar files are to be downloaded from the central repository to the local repository. Open pom.xml is in the edit mode, create dependencies tag (<dependencies></dependencies>), inside the project tag. Inside the dependencies tag, create dependency tag (<dependency></dependency>). Step 4 − Add dependency for Cucumber-Java: This will indicate Maven, which Cucumber files are to be downloaded from the central repository to the local repository. Step 5 − Add dependency for Cucumber-JUnit: This will indicate Maven, which Cucumber JUnit files are to be downloaded from the central repository to the local repository. Step 6 − Add dependency for JUnit: This will indicate Maven, which JUnit files are to be downloaded from the central repository to the local repository. Step 7 − Verify binaries. Go to Project → Clean − It will take a few minutes. 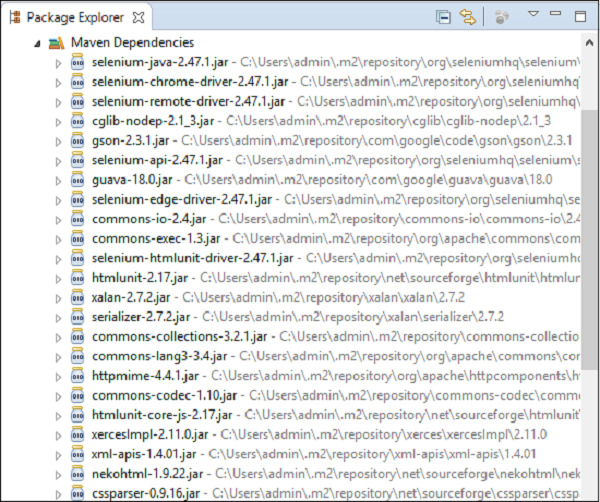 You will be able to see a Maven repository like shown in the following screenshot. Create a feature file (to be covered later). Create a step definition file (to be covered later). Create a JUnit runner to run the test (to be covered later).